A few months ago, we were sent Super Gummy supplements by the brand Super Gummy. As a mom, it’s important for me to take special care of my children when it comes to their diet and nutrition. While I try my best to give them a healthy and a balanced diet every day it’s also important to start supplements for children. 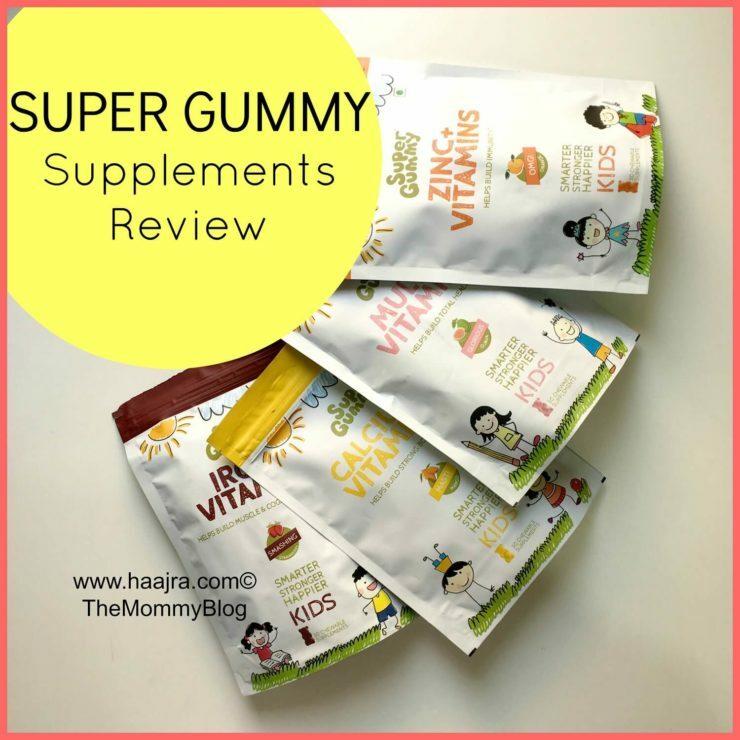 We have been using these gummy supplements by SuperGummy so here’s my detailed Super Gummy Health Supplements For Kids review for you. At first glance, I fell in love with the packaging. It’s too adorable to handle. Each flavor comes in a different colored packaging which is lovely. I liked the fact that it is free of artificial sweeteners and preservatives. Each pack contains 30 gummies which retail for 130 INR. The packaging is extremely adorable and colorful. Each pack contains 30 gummies which are individually packed. Each variant comes in a different color depending on the flavor of the supplement. SuperGummy offers a very good variety of supplements. Multivitamins, Zinc + vitamins, Iron + Vitamins, Calcium + Vitamin D are the currently available ones. The ingredients of the Super Gummy health supplements are not mentioned on the packaging. Or at least I didn’t notice them anywhere. However, the brand claims all their supplements are free of gelatin and other food allergens such a gluten, milk, soy, eggs etc. The brand, SuperGummy claims that these yummy chewable supplements will give your child all the nutrients they require every day. The SuperGummy Supplements are free of artificial sweeteners and preservatives. They are made with natural colors and flavors. Gummies are free of gelatin and other food allergens such as milk, soy, eggs etc. Give two gummies every day for children aged over 3 years. Always give the gummies under adult supervision as advised by the brand. And make sure the child chews the gummy thoroughly before swallowing. Storing the SuperGummy supplements is very issue as each gummy is individually packed. If you stay in a very humid country like I do, I recommend you can put them in the refrigerator. At least this is what I do. We received the Super Gummy health supplements a couple of months ago. Let me tell you not every child will love all the flavors. Our eldest is picky when it comes to food and taste, she won’t try new food easily, so she would eat only the Calcium and Vitamin D gummies and the zinc gummies. The other girl loves experimenting and never hesitates to try new flavors and textures, she loved all of them. She still enjoys choosing her own gummy for the day depending on her mood. So if you have a picky eater I recommend you try the calcium and zinc one first then move on to other flavors gradually. These supplements come in different flavors and variants. Super Gummy supplements have the most adorable and bright packaging. These are very reasonably priced to suit everyone’s budget. Each gummy is individually packed which makes them very travel-friendly. These supplements are not available outside India. At least I have not spotted them anywhere here in Qatar. I really hope the brand makes new supplements in flavors like cheesecake, banana smoothie, apple pie, caramel pudding etc. They would make such an awesome treat for kids of all ages (and their parents too). 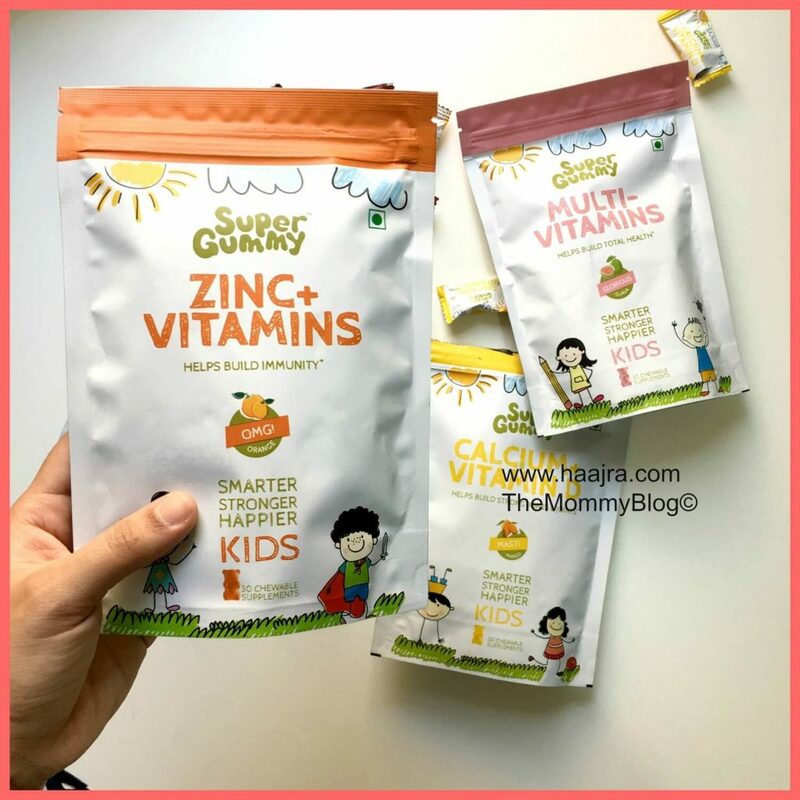 Will I recommend the Super Gummy Health Supplements to other parents? Absolutely. Every parent with kids over than 2 years of age should definitely give these a shot.They are totally worth trying. I’m sure you won’t regret it. Let me know if you tried these. Was this review helpful to you? Did I miss anything? Disclaimer: This product was sent to me in exchange for an honest review. 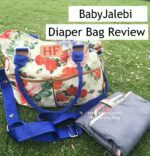 Neither I nor The Mommy Blog was compensated to do this review. 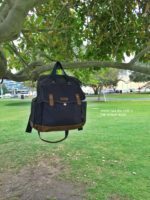 The review is purely based on my experience and is not a proven one. All opinions and images are my own and property of The Mommy Blog. 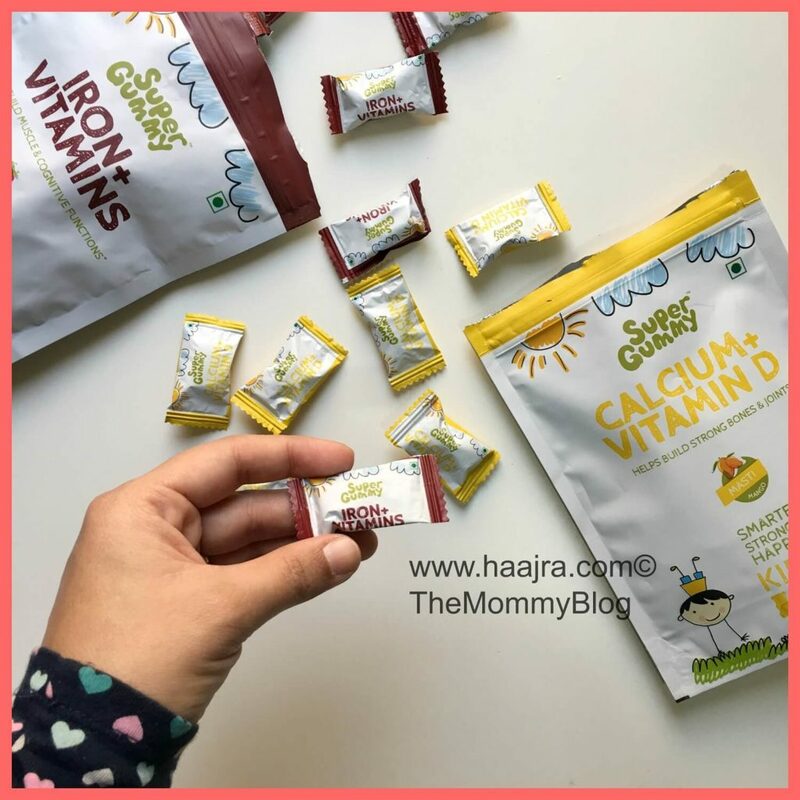 The review looks great, will give these gummies a try once my baby will be over 2 years. Wow Gummy supplements. This is interesting. I was not aware something like this existed. I am so tempted to order them right away for my kid. Thanks for sharing the review. The packaging is definetely attractive, though picky kids might not like the flavours but they will be attracted to try a new one everytime due to its package. So its definetely worth a try. Is this only for toddlers or for older kids also? My daiughter is 8 years and she is into sports so will this additional supplement help her. I have been thinking of getting these for Karma for ages but didn’t know anyone who had tried them out. Now that I’ve read your review, I’ll get them. I have heard about them and even recommended to few of my family and friends. Agree, kids above 2 years need extra nutrition and I am sure they will love it in the form of gummies. Being a toddler mommy, I am quite excited to buy this for my girl. Thanks for sharing the detailed review. The brand itself says “Give two gummies every day for children aged over 3 years”. But most of the people says it can be given to kids above 2 years old. I am really confused by this. Should it be given to a kid above 2 years old or above 3 years old?